She was born Isabel Flores de Oliva in the city of Lima, then in the Viceroyalty of Peru, on April 20, 1586. She was one of the thirteen children of Gaspar Flores, a Harquebusier in the Imperial Spanish army, born in Baños de Montemayor (Cáceres, Spain), and of María de Oliva y Herrera, his wife, a criolla native of Lima. Her later nickname « Rosa » comes from an incident in her babyhood, a servant claimed to have seen her face transform into a rose. There was always something mysterious about the little Rosa who seemed to grasp the most fundamental aspects of the Faith and most especially of Prayer. Shortly after the age of four years, shef knew how to read, without ever having learned it. She will feed on the narrative of saint Catherine's life of Siena which will become its model of spiritual life. She decided then to dedicate her life to God. Her mate player was her brother Hernando, who always helped her. At the age of twelve, she went to live with her family towards Quives, town around 60 km from Lima, located in the Chillón valley. Here, in 1597 she was confirmed by the Archbishop of Lima, Toribio de Mogrovejo, who was also to be declared a saint. She formally took the name of Rosa at that time. She returned to Lima with her family when she was already a young woman. Apparently, it’s in Quives where she began her mortifications and contracted a very strong rheumatism with serious health consequences that she hid from her mother. 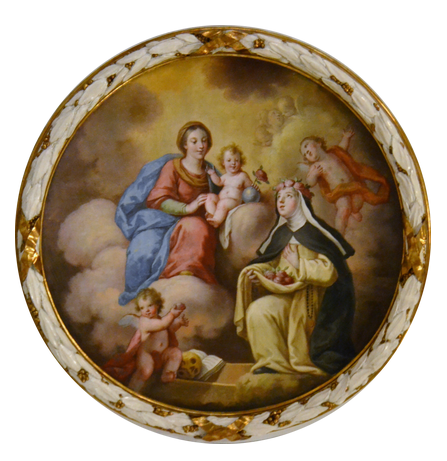 As a young girl, in emulation of the noted dominican tertiary saint Catherine of Siena, she began to fast three times a week and performed severe penances in secret. Despite the censure of her parents, she spent many hours contemplating the Blessed Sacrament, which she received daily, an extremely rare practice in that period. She was determined to take a vow of virginity, which was opposed by her parents, who wished her to marry. When she was admired for her beauty, Rosa cut off her hair and smeared pepper on her face, upset that men were beginning to take notice of her. She rejected all suitors against the objections of her friends and her family. Finally, out of frustration, her father gave her a room to herself in the family home. Rosa was normally obedient to her parents, but not their wishes which interfered with her spiritual quest. She worked hard, both at her studies and at her domestic work. In her twentieth year she donned the habit of a tertiary Dominicans and took a vow of perpetual virginity. But, as there was no convent in the city where she lived, she takes refuge with a tiny hermitage, quite at the back of the garden of her parents, where she will spend the rest of her life in the prayer and the humiliations. After daily fasting, she took to permanently abstaining from eating meat. Later, she feeds only on bread and water. She helped the sick and hungry around her community, bringing them to her room and taking care of them. At the same time, she devotes herself in the service of Indians, deserted children, old men, counter, and sick. She sold her fine needlework and grew beautiful flowers, taking them to sell in market to help her family. Also, she made and sold lace and embroidery to care for the poor. She was taught to make herbal medicines and took great delight in distributing these remedies to the sick poor of Lima. 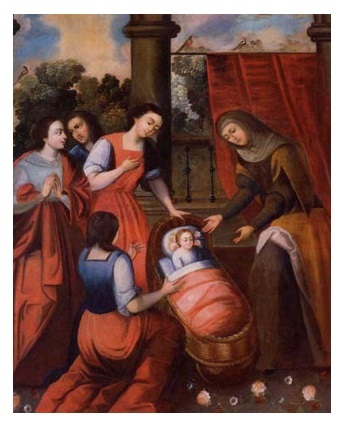 Her only support came from the Dominican Saint, Brother Martin de Porres, who assured her that her visions and spiritual aridity were signs of the highest friendship with God. She also benefited from mystic graces such as the distrust of the Inquisition was worth to her several examinations on behalf of the religious authorities, her profound answers amazed then her detractors. She prayed and did penance in a little grotto that she had built with one of her brothers. Otherwise, she became a recluse, leaving her room only for her visits to church. She only allowed herself to sleep two hours a night at most, so that she had more hours to devote to prayer. 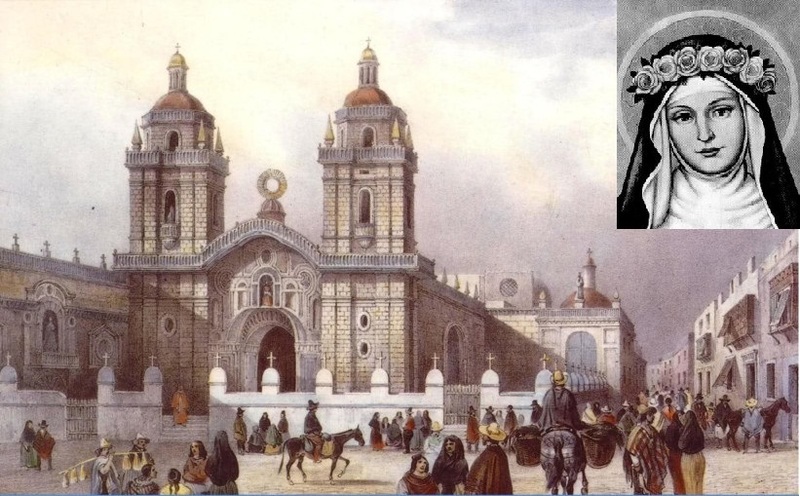 Rosa prayed long hours for her beloved Archbishop Turibius and beseeched God for the conversion of the Peruvian Indians, who were still practicing pagan religions. She donned a heavy crown made of silver, with small spikes on the inside, in emulation of the Crown of Thorns worn by Christ. By intense physical punishments, she offered herself to God as a bloody victim in union with the Christ for the purchase of the souls of the Purgatory and the conversion of all the sinners. Not satisfied with wooden boards on which she slept, she made a bed with pieces of wood bound with ropes then fills the intervals of fragments of dishes and tiles with the acutenesses upward. She will sleep in this bed on the last sixteen years of her life. Near the end of her life, she fell seriously sick. She passed the last three months of her life in Gonzalo de la Maza's home, a notable book-keeper of the vice royal government, who had a particular affection for her. She died on August 24, 1617, at the early age of 31. It is said that she prophesied the date of her death. Her funeral was held in the cathedral, attended by all the public authorities of Lima. 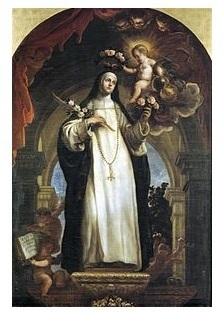 Rosa was beatified by Pope Clement IX on May 10, 1667. She was canonized on April 12, 1671, by Pope Clement X. She is the first Catholic in the Americas to be declared a saint. 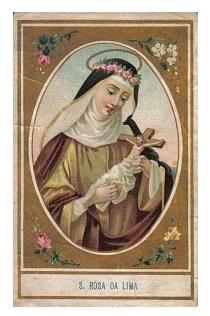 Saint Rosa of Lima is the Patron Saint of Americas, Philippines and Peru, the city of Lima, the National Police and the Catholic University of Peru. She is also the Patron Saint of gardeners and florists. The Roman Catholic Church says that many miracles followed her death: there were stories that she had cured a leper, and that, at the time of her death, the city of Lima smelled like roses; roses also started falling from the sky. Many places in the New World are named Santa Rosa after her. It is also said that she managed to be simultaneously in several parts of the world. - « Hum! Patron and Saint! And Rose? and he got an instant answer, a flagrant rain of roses on the table of the Pope who in that moment proceeded to her canonization. 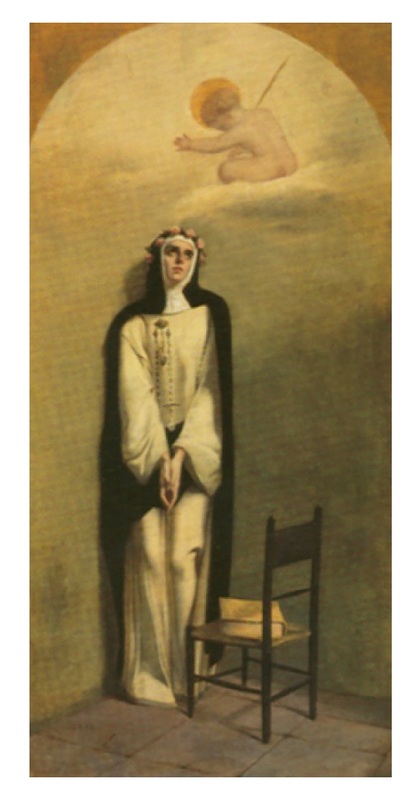 Being Rosa deformed by the punishment, it drew the attention of people which made her worship as a Saint. Sorry, she turned to God, so that her fasts do not change her face. Admirable thing! It came back her deep colours and her eyes revived. - « See this so famous nun by her punishment! She comes back from a feast. Rosa thanked God for it. The most spectacular of Rosa’s miracles occurred when Dutch pirates invaded Lima’s harbor and defeated the Peruvian fleet. They intended not only to loot the city but also to desecrate the churches. Women, children and religious of Lima took refuge in the churches. In the church of Santo Domingo, Rosa stirred all of them to prayer. It is said that as pirates burst into the church, they were confronted with the terrifying spectacle of a young girl ablaze with light, holding a monstrance with the Blessed Sacrament. They turned away and fled to their ships, which sailed away. One of Rosa's last visions was of seeing herself in the middle of a beam of light which she knew extended from the source of all goodness which is God. Within the light, there was a beautiful rainbow of many beautiful colours. Also Rosa saw a Cross covered in the precious blood of our Lord. Through this beautiful light Rosa could also see our Lord resplendent and so bright that she could almost not bear to look upon Him, Rosa was enraptured. Next to our Lord, Rosa also saw a set of scales and surrounding these scales were Angels and souls upon the scales, the Angels placed great weights which Rosa knew were tribulations and sufferings to come. She also saw the weight of her own scales and knew she would suffer much. Once the sufferings had been completed the Angels then placed graces upon the scales the graces were equal to the sufferings. Rosa knew this meant that for every suffering there is the compensating grace which helps the soul endures suffering for the sake of love. Rosa then felt her own soul fill with an abundance of Graces. Santa Rosa of Lima had a garden with several puddles of water with many mosquitoes that were troubling to the family. 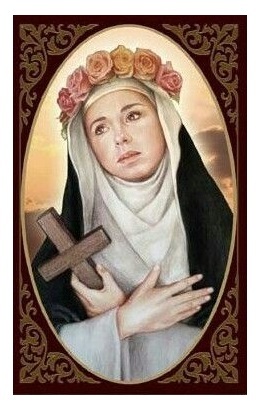 One day Santa Rosa built a hermitage for her prayers and asked them to never bother neither to her nor to her family. In exchange she promised never to bother them. Since then, the mosquitoes lived calm and grateful they were accompanying Rosa's prayers playing melodies with tiny little trumpets. But, one day, a bigoted woman, called Catalina, killed a mosquito that had bit her. Then, Rosa asked them not to damage themselves any more. Another bigoted woman, called Frasquita Montoya, did not want to enter to the hermitage because there were mosquitoes. - and the two others, in the name of the Son and of the Holy Spirit. The family of Saint Rosa of Lima had a littler rooster very loved by all. But one day the bird fell ill and the mother of Rosa proposed her to kill it and to cook it. Then, the Saint asked the rooster to get up and to sing very loudly to save its life. Quiquiricuando (I’m coming, they are brushing me)». - Visitando el santuario de Santa Rosa de Lima - labrujula delazar.blogspot.fr.